(MENAFN - The Conversation) Informal settlements continue to remain a significant component of many cities in the developing world. UN Habitat describes them as lacking security of tenure, not having durable housing and short of basic services. Globally, almost one billion people are hosted in informal settlements. This is expected to increase to 1.5 billion by 2020. In sub-Sharan Africa, about 60% of all urban residents reside in slums and their level of deprivation is considered to be comparatively severe . In view of the recent urbanisation trends on the continent, much of the projected urban population growth is expected to be absorbed by slums . In spite of this reality, slum dwellers continue to be marginalised, brutalised by the state and forcefully evicted . They are also frequent victims of demolitions and displacements. However, slums are critical for the future wellbeing of many urban residents across the continent because they provide a refuge . This is true in Accra where close to half of the city's population live in informal settlements. According to the Ghana Housing Profile , 60% of all urban households in Ghana occupy single rooms. Only 25% of households own a house. The remainder either rent or live rent-free in a family house. Urban housing is also regarded as very expensive. 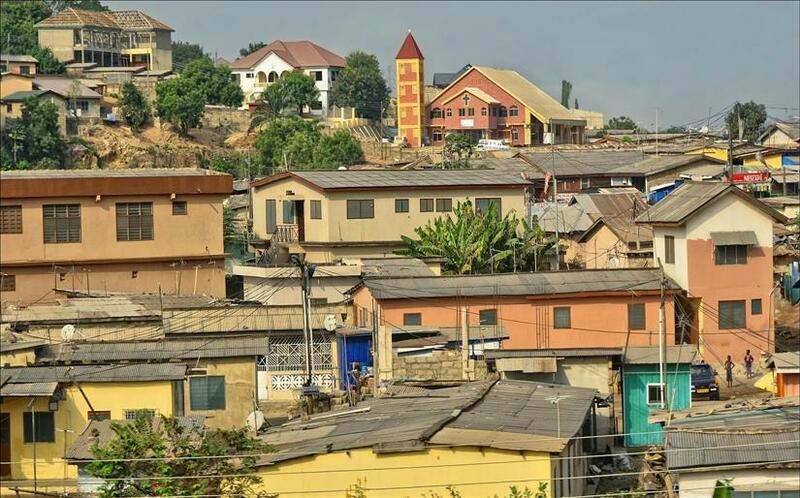 Because of a lack of affordable, decent and secure shelter for the low-income population it's generally accepted that there's a housing crisis in the Ghanaian capital. This crisis was instigated by the withdrawal of the state as an active provider of housing. The state withdrew following the adoption of the World Bank and International Monetary Fund's structural adjustment programs introduced in the 1980s . At that point market-led policy became the mainstay in housing provision. The private rental housing market was commercialised resulting in a boom in profit-driven housing production that targetted high-income residents. Thanks to rising land prices , a decline in the access to land , and a lack of access to housing finance, many low-income and lower-middle class workers are pushed out of the housing market. This has pushed most of them to rely on the informal rental sector. There, landlords exploit the vulnerability of the their tenants often demanding several years of rent in advance . About 45% of Accra residents live in some form of slum housing. These areas are overcrowded, have limited access to piped water and poor sanitation facilities. But this is only part of the picture . Slum housing means more to local residents than the stereotypical depictions of deprivation and poverty. Urban slums like Old Fadama allow many people to escape the near homelessness that Accra's housing crises creates. Old Fadama is the largest informal settlement in the city of Accra. In media and political circles it is often cast as dystopian . But for many it's the one of the few places they can be assured of access to cheap and alternative housing while still remaining close to core services in the city of Accra. Since then the population has grown substantially. Between 2004 and 2007 , for instance, the population doubled from 24,000 to 48,000. The most recent data suggests that nearly 80 000 people now live in the area. This exponential growth can be attributed to the fact that Old Fadama provides cheap, centrally located housing. Moreover, not all housing is substandard . Relatively better-quality houses can be found in unplanned areas at more affordable prices than other areas in Accra. This is borne out by the fact that Old Fadama doesn't only house the informal poor . A recent study suggested that about 15% are formal sector employees. Old Fadama is an entry point to basic housing for those in both low-paid formal and informal employment. For many in this slum, access to cheap housing in the city's economic heartland has made it possible to capitalise on their capabilities, and enabled them to try and move out of poverty . There's an urgent need for targeted interventions around slum housing in Accra. Fortunately, the 2015 National Housing Policy , and the newly established Ministry for Inner City and Zongo Development, are good starting points. Both emphasise support for the urban poor and low-income housing. Additionally, civil society groups are experimenting with collective self-help housing – such as the Amui Dzor Housing and Infrastructure Project implemented by the Ghana federation of the urban poor in collaboration with the government and UN Habitat– for low-income groups. In view of this, we suggest that there is a need to combine policy support with project experimentation for house improvement in urban slums. This should be considered as part of a housing program that involves state leadership in providing 'real' affordable housing. There is also a need to provide funds for social housing, enforce regulation of the rental market, and support the informal housing sector. This would add up to a solid commitment towards every citizen's right to decent, secure and affordable housing.